Lobi (in Bouna division) and Mere (but this confuses with the name of zebu crosses with Lobi). Dwarf animals, with massive head; short and stout horns; short neck, thin in cows and heavy in bulls; well-rounded body and straight back-line; tail-head is high and thick; variable coat colour, mostly black or black pied. Found in North and central regions of Cote d'Ivoire and scattered throughout the forest zone. Baoule cattle are grouped into several nucleus herds in Korhogo (Sinematiali) region, Bouna, Dabakala and central and High Nzi valley, where they are herded by Peuhls (Fulanis). Also found in the southern tip of Mali, across the south-west of Burkina Faso. 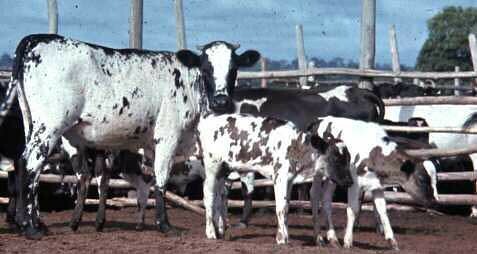 A Savannah Shorthorn type of cattle in Cote d'Ivoire. They may have some N'Dama blood.